This Article discusses DC Electricity concepts and terminology at an introductory level. There are always discussions on boating bulletin boards relating to DC power systems on boats. This article is intended to help those with little or no background or training in electrical systems to understand those discussions. I have included the most important sub-topics related to 12V and 24V “low-voltage” DC power distribution systems encountered by typical cruising boat owners. There is one, and only one, absolute when dealing with electricity. VIRTUALLY ALL ELECTRICITY CAN BE DANGEROUS TO PROPERTY AND LIFE. Even de-energized electrical circuits can retain enough stored energy to create a life-threatening hazard. 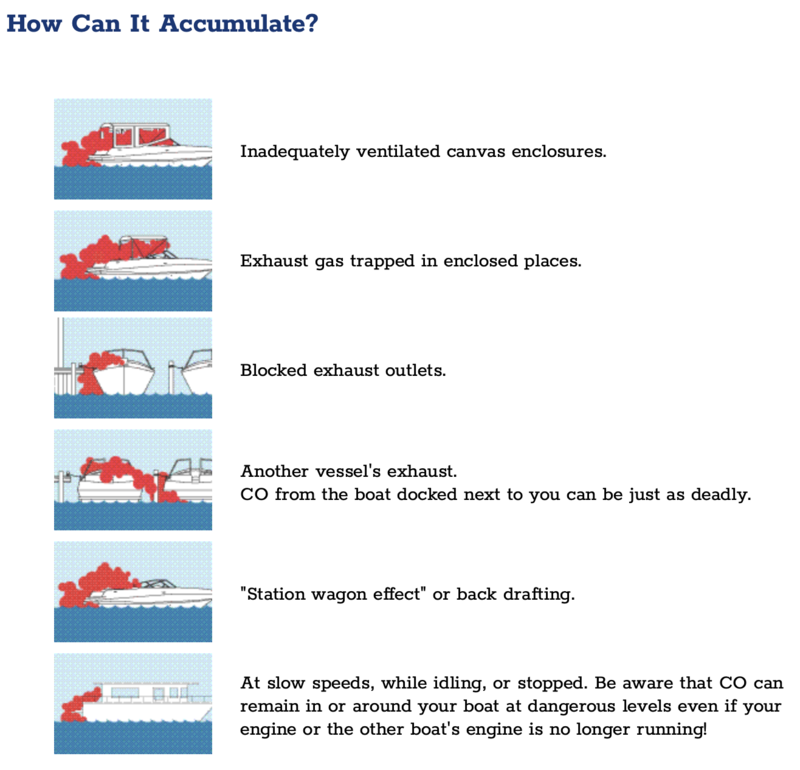 The large batteries and large banks of batteries found on boats can produce explosive gasses and store enough energy to easily start a large, fatal fire. ALWAYS WEAR SAFETY GLASSES while working around electricity! WEAR HEARING PROTECTION when working in noisy environments, with running engines or other loud machinery. Well, then, LEAVE IT ALONE until you do! USE INSULATED TOOLS when working around electricity, and especially around batteries. Batteries contain enormous amounts of stored energy. Accidental contact of a metal tool across the terminals of a battery is an emergency situation. The tool can actually weld to the battery terminals and be both too hot to touch and impossible to remove without external mechanical force. Whenever working around a battery, pre-plan to have a two foot piece of 2”x4” readily available at hand. If the worst should happen, use the wooden 2”x4” to knock the metal tool away from the battery terminals. DO NOT TOUCH the tool; assume it will be far too hot to handle with bare hands! Once this cascade of events has started, the only way to stop it is to break the tool free of the battery terminals. Otherwise, the battery will get so hot it will melt and may start a fire. Be very wary of unfamiliar, pungent odors. Transformers, motors and most electrical and electronic devices that are in the process of failing often heat up and cause insulating or potting materials to give off strong, pungent odors. TURN OFF POWER and use your nose to track down the source. Treat this as a true emergency. If you can find the offending device before it bursts into flame, you’re way ahead of the game! Turning off the power will usually allow the device to cool off. Do not restart the device! Excessive over-heating often causes secondary internal damage that you cannot see. 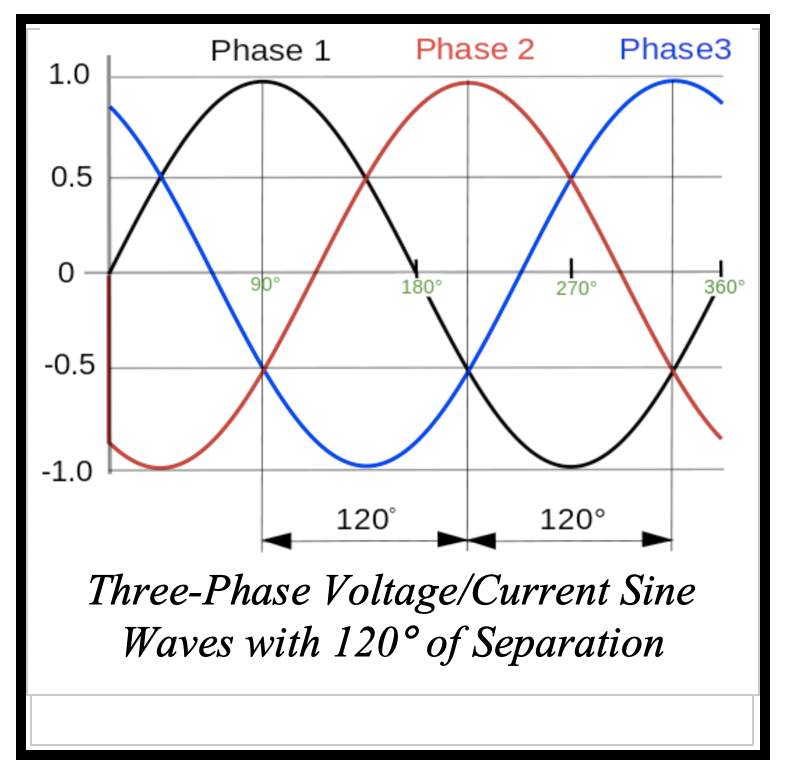 DC voltages at their source are characterized by 1) a stable voltage amplitude of 2) unchanging polarity; i.e., the polarity of the voltage between the supply and return terminals never changes. One battery terminal is considered “positive” and marked with a “+” sign, and one battery terminal is considered “negative” and marked with a “-” sign. Terminals are either “positive” or “negative” with respect to each other, nit the external world. The “positive” terminal is positive with respect to the “negative” terminal; the “negative” terminal is negative with respect to the “positive” terminal. 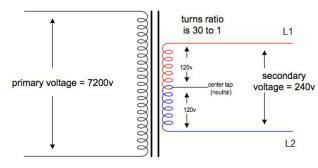 This distinction is important in using a voltmeter to measure voltages. A DC voltmeter will provide both the amplitude of the voltage that’s present and the polarity of the conductors or components between which the meter is attached. The amplitude of the voltage can vary somewhat over time, as over the period of time that a battery discharges, but the polarity of that voltage between battery terminals does not change. This is the fundamental difference between AC and DC electricity, and that difference leads to all of the technical advantages and disadvantages the different electricity technologies offer to users. The following are some terms regularly used in listserv posts and widely encountered in discussions of electrical systems and circuits. Boaters will do themselves a great favor by learning these terms and understanding the concepts these terms represent. Source – Point-of-origin of an electric current. Typically for DC systems, a battery or bank of batteries. Electrical sources are “balanced systems,” in that whatever current leaves must return to the source on a one-for-one basis. If a return path is not available, current cannot flow and useful work cannot be performed. Load – The components within an electrical system that consume electrical energy to operate; ex: lights, heating elements, motors and electronics. Circuit – a network of conductors and components carrying electric current from the source to the load, distributing current throughout the load, and returning current to the source from the load. 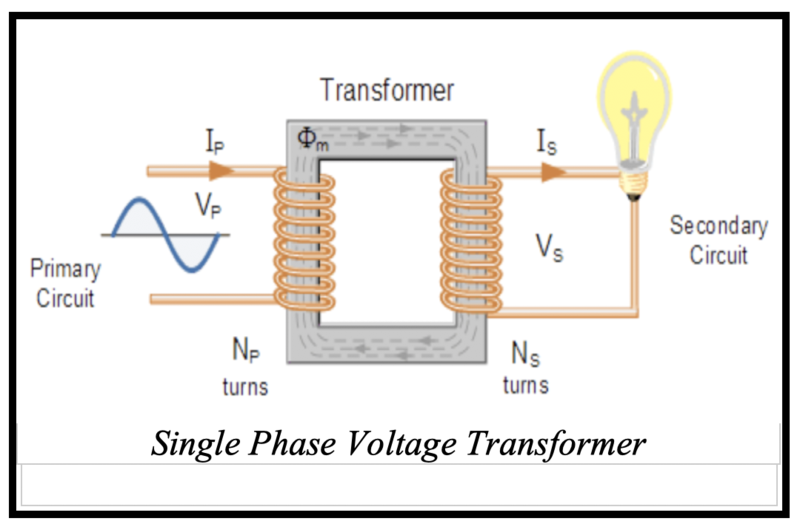 Circuits are always closed loops that originate AND terminate at the power source. Return (or “B-”) – the current-carrying conductor that returns power from the load back to the source. In negative-ground DC systems as required by ABYC on boats, often called “B-.” Analogous the the “neutral” conductor in AC circuits. Conductor (lead, line, cable) – circuit device that transports electric currents. 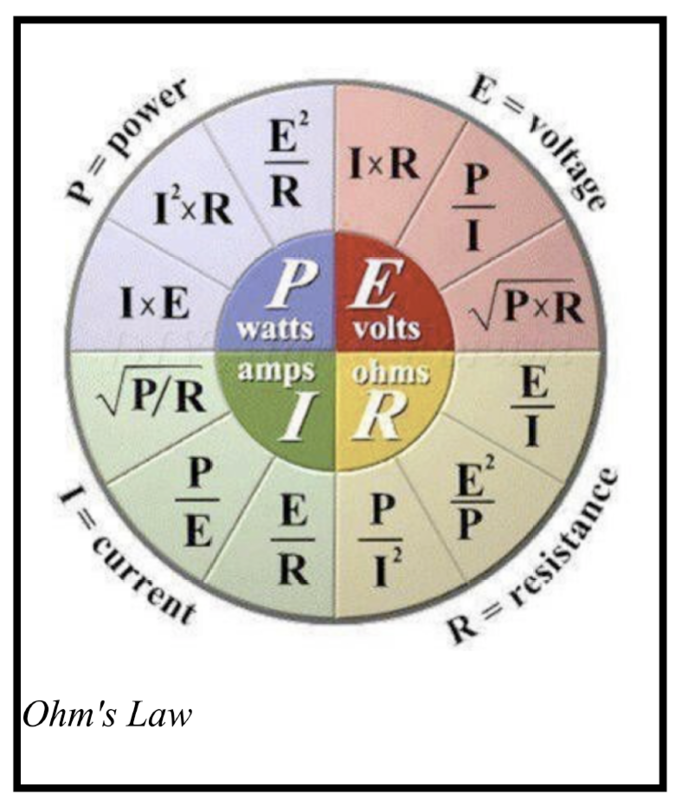 Ohm’s Law – Mathematical formula that describes the relationships between voltage (V), current (I), resistance (R) and power (P) in a circuit. 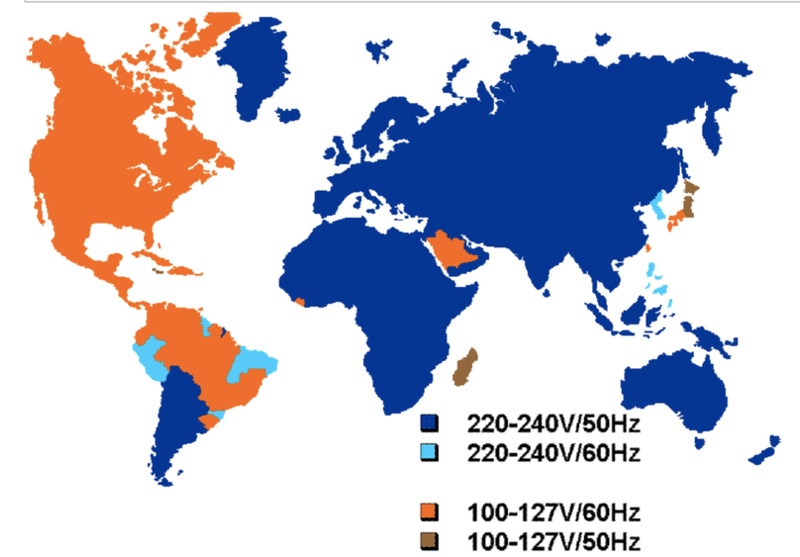 Ground – a) a universal standard earth reference voltage of “0” volts; b) conversationally, the portion of an electrical circuit to which all other parts are referenced. Neutral – a non-ground, normally current-carrying return path for electric currents; customarily used in the context of AC circuits. 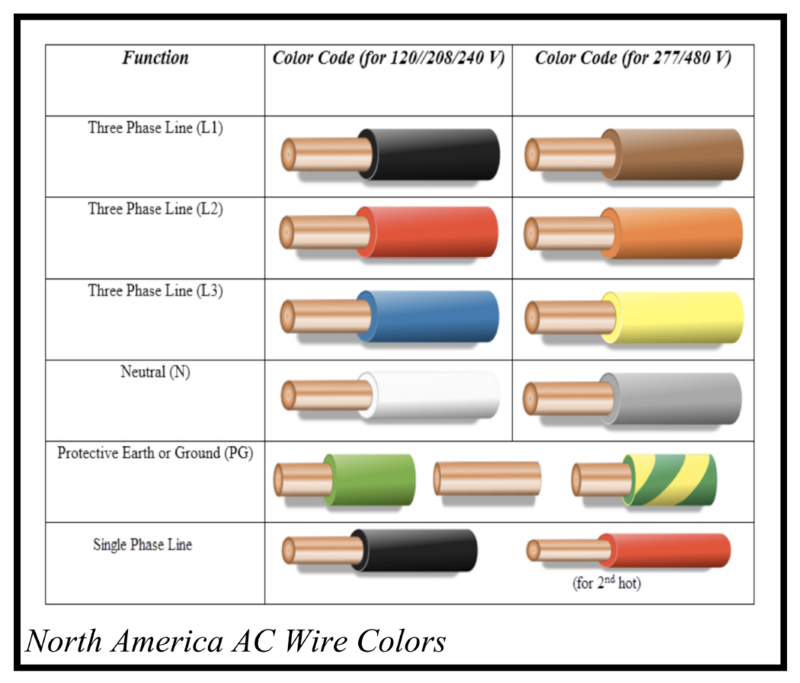 In DC applications, B- conductors are analogous to the AC neutral. Fault current – a current flow that follows an abnormal and unexpected path from its source to its return point. Short circuit – an electrical fault condition resulting from the unintentional connection of a source directly to a return circuit or earth ground. This unintentional connection often results in the flow of extremely large fault currents. The electrical system should be designed in such a way that fault currents are automatically interrupted by circuit breakers of fuses. This condition may not cause overload protection devices (circuit breaker) to disconnect the source of power in “ungrounded” systems..
Raceway, Conduit, Spiral Wire Wrap, Split Wrap – varieties of supplemental physical enclosure intended to protect electrical conductors from accidental physical damage, excessive ambient temperatures and vibration. Switchgear – a generic term for all equipment housings in which fuses or circuit breakers and similar disconnecting or switching devices are mounted. This term is used across the electrical power industry, from generating stations to transformer yards to neighborhood distribution yards to commercial and residential locations. ABYC – American Boat and Yacht Council, Annapolis, MD. An organization that produces a comprehensive set of safety standards applicable to boats and boat manufacturers, the marine insurance industry, surveyors, attorneys involved in litigation and boat owners. NEC – National Electric Code; United States electrical design standards for Power Generating and Distribution Systems, state, county and community code regulations and the electrical construction industry. NFPA – National Fire Protection Association; organization that creates and maintains the NEC. a conductor that transports the electric current back from the load to the energy source. By definition, an electrical “circuit” must contain all four of the above elements. All electrical circuits (DC or AC) originate as a pair of electrical terminals that are connected to power-consuming load devices by conductors (wires) of one type or another. Electric current flows through a circuit. If a complete electrically-conductive loop is not available from “source” through “return,” an electrical current cannot flow. Switches, fuses and/or circuit breakers are used to create an incomplete electrical path from the source to the load. An electric current is the aggregate of millions of migrating electrons (and ions in liquid media). In DC circuits, it is “convention” to think of the electric current flowing from positive to negative. This “convention” Is a “working agreement” across all electrical standards bodies, trades and professions. By mutual agreement, all electrical diagrams of DC circuits and electronics circuits are shown with symbols that assume current flows from positive to negative. It is a fact of atomic physics that electrons carry a negative electrical charge, so migrate from a more negative place to a more positive place. As in most “conventional agreements,” as long as the convention is agreed and understood, the pesky facts of atomic physics can be overlooked and left to scientists. The term “common” applies broadly to circuit elements that are shared among all of the broader network of electrical attachments in a installed electrical system. The supply buss (“hot, B+”) and the negative return buss (“B-”) are examples of common circuit elements. Virtually all DC systems encountered by the general public are low-voltage circuits, generally 12-volts, occasionally 24V or 32V. Examples are 12-volt motor cycle, automobile, light truck, lawn tractor, residential emergency generator, snow thrower or all-terrain vehicle starting batteries, and similar yard and garden devices. Other low-voltage battery-operated devices include fire/burglar alarms, Uninterrupted Power Supplies (UPS) for computers and data networks, hand-held spot lights, wireless telephone systems and a very wide variety of portable tools. For applications in the automobile, truck, and outdoor equipment sectors, the return terminal of the battery is typically attached to the metal frame of the vehicle/equipment upon which the battery is mounted. The frame is the “common” return path for all sub-circuits. Electrical components (starter motors, blowers, horns, light sockets, solenoids, sensors, gauges, electronics, etc) have internal electrical return connections that attach to the vehicle’s frame. The electrical connection is created when the component is bolted to the chassis of the vehicle. No discrete return conductor is needed because the metal vehicle chassis is the common electrical return path. This approach simplifies wiring and mechanical design, reduces component design complexity, reduces material and labor cost, and eliminates wiring and connector materials and weight. The metal frame of a vehicle is perhaps the most obvious place where the term “common” would describe a broadly-shared circuit component. electric currents of even the smallest magnitude flowing in metal hulls, metal stringers and/or metal frame members lead to corrosion of the metals, and are always undesirable on boats. 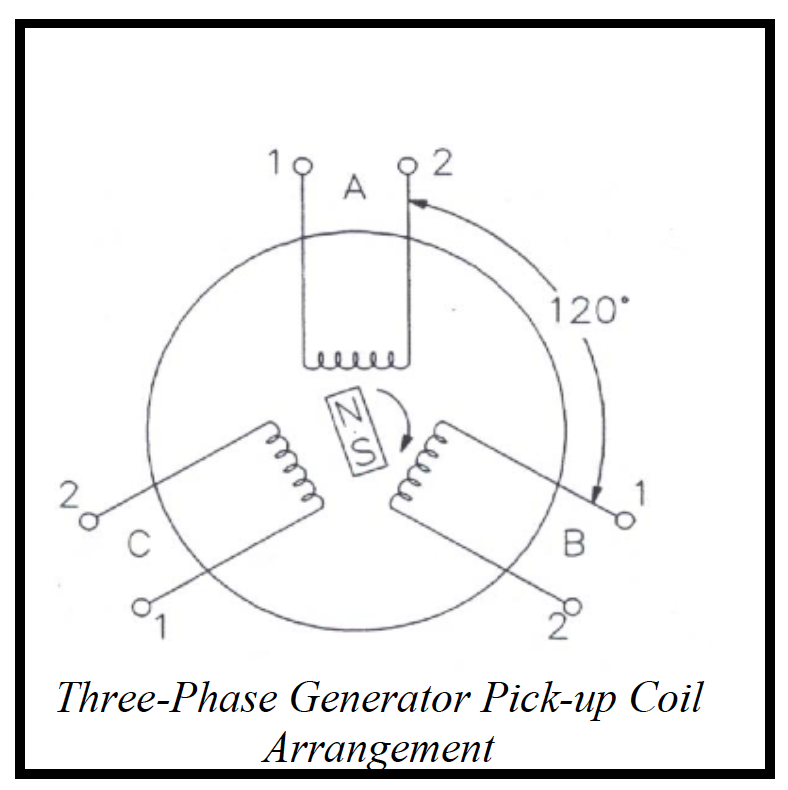 Electrical appliances and utility attachments intended for marine DC applications are designed to have at least two wires; one for the supply of current that originates in the source (B+), and one for the explicit return of that current back into the source (B-). In all of the preceding discussion, I’ve intentionally referred to the “electrical return path” using that specific term. In ordinary conversation, the term “ground” is often used to describe the return path of a DC circuit. This is a technical “liberty” of conversation, since DC return paths are often not actually connected to earth ground. “Ground” in this context is a term of convenience and convention. The return path from a low-voltage DC load to its source (B-) is not inherently at zero volts with respect to its surroundings. A battery held in hand or sitting in a dock cart has two terminals, but neither is referenced to it’s surrounding environment. Consider a bird sitting on a high-voltage overhead wire in a residential neighborhood. The wire is at thousands of volts with respect to the earth, and so is the bird’s body and all of it’s little body parts. But, the bird is safe, the tiny electric currents that make the bird’s heart beat still work, because there is no return path from the bird’s body to enable a disruptive external current to flow. As soon as the bird flies off, the voltage is gone. The bird’s body voltage changes, but the bird’s heart still beats normally, and the bird survives, completely unaffected for the contact with that man-made high voltage. Consider a car, then, that is mounted on rubber tires. Since rubber is a fairly good insulator, it would be possible for a DC voltage to exist between the earth and the frame of the car. Normally small, this voltage can be thousands of volts. Readers who have ever visited or lived in cold climates are undoubtedly familiar with the static shock that can happen when exiting a the car. That static shock was a blast of high voltage DC caused by the transfer of accumulated charge from the vehicle, through the body, to the earth. (Well, for purists, electrons flow from the earth, through the body, to the vehicle, but to the shockee, that detail is uninteresting.) Static electricity and lightening are the same phenomenon, only on a much different scale! The possibility of static shock is why every gasoline dispensary in the country instructs drivers to remove portable gas cans from cars and place them on the ground before filling them. Grounding the container disburses any static charge. It is technically non-trivial to create a reliable earth ground on a car. Some readers may have seen ground straps dangling from trucks and some cars. Used mostly on trucks, those straps are intended to protect toll takers and others who might come into contact with the vehicle from static shocks and to provide a safe path to ground static charges. It is obviously difficult to create a reliable earth ground on a boat, impossible on an airplane. Historically, earth grounding was not regarded as an important design goal for DC electric circuits. And of course, experience with low voltage DC equipment generally bears out that assumption. We get shocks from the build-up of static, but we don’t get shocks when we step off the garden tractor or use the snow blower. Who among us has never disconnected a car battery when standing on the ground, and that was not a shocking experience. What this all implies is that, even though the DC return circuit may not actually always be at the electrical potential of earth ground, the DC return circuit in all of our familiar yard equipment, cars and SUVs is referred to in ordinary discussion as the circuit’s “ground”. This use of the term “ground” refers to the functional return path ground, not a safety ground. As society gained experience with electricity in the early and mid-20th century, it became obvious that there had to be a way to ensure the return path is always at “earth ground” potential in order to avoid the possibility of personal harm or property damage resulting from accidental contact with electric power. A safety ground is not required for a circuit to operate correctly, but it does provide other compelling benefits. Consider a fiberglass boat. Aboard, there are many parallel DC sub-circuits. Water pumps, space and nav lighting, nav and entertainment electronics, windlass, thruster, the propulsion engine, etc. They are all at distances from one another, and the fiberglass frame of the boat is non-conductive. A safety ground in a DC system (if present) interconnects the external frames and metal cases of equipment, appliances and utility attachments (light switches, outlets, motors, electrical equipment, radios, etc.) to a known point of common potential. That common point is always the negative terminal of the battery, and under some specific conditions, the water in which the boat floats or the earth itself. A safety ground is separate from the functional return circuit, and always involves the installation of it’s own individual electrical conductors. In service, a “safety ground” is never intended to carry current in normal operation. However, in a circuit containing an electrical fault condition, a safety ground is intended to prevent a personal shock hazard or mitigate property damage risk by ensuring the electrical potential is at earth ground potential. It is the “safety ground” that provides an emergency path that allows a circuit breaker to function and disconnect power. Consider, for example, a bow thruster or an anchor windlass. We would expect to have a battery positive connection to the positive (B+) terminal of the device’s motor solenoid, and a battery negative connection to the negative (B-) terminal of the device’s motor solenoid. The motor would then be expected to operate correctly with just these two battery connections. 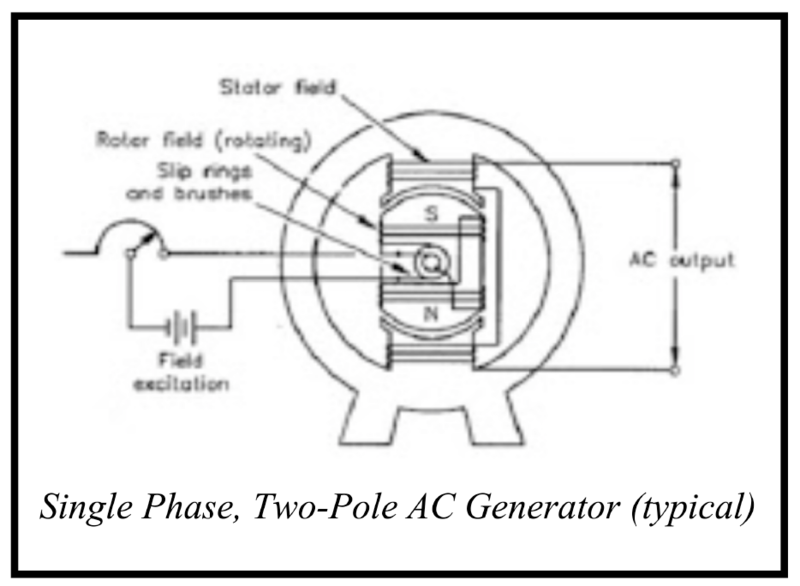 If we also had a separate conductor from the mounting frame of the device to the vessel’s bonding system, that would be considered the “safety ground.” The thruster would run just fine without the safety ground, but the device could malfunction and place the frame at some non-zero electrical potential. Designers of DC electrical distribution systems refer to them as either “grounded” or “ungrounded” systems. The terms “grounded” and “ungrounded” refer to the presence or absence of a safety ground, not the functional return circuit. A return path of electrons to their source is always required, but that return path is not always referenced to anything else! There is valid debate among experts as to whether 12-volt, 24-volt and 32-volt boat DC systems can be of the “ungrounded” design or should be of the “grounded” design. Today, DC grounded systems are not common. However, new and emerging vessel propulsion systems containing large-horsepower (hP) diesel-driven DC generators and large-horsepower DC motors (systems analogous to diesel-electric train locomotives) are definitely high voltage applications (often between 600VDC and 1000VDC). Faced with the emerging presence of true medium and high-voltage DC equipment on pleasure craft, this safety ground design choice is now specifically being re-evaluated in the American Boat and Yacht Council’s (ABYC) Electrical Technical Committee. We await that outcome. the electrical skills those individuals who have performed electrical work in the highly specialized marine environment. full DC safety grounding, vessel-wide. 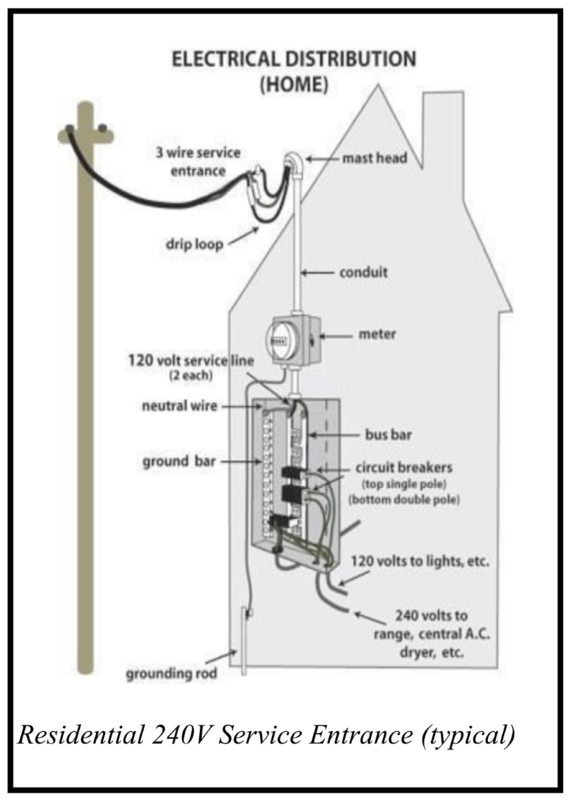 The ABYC does not require that low-voltage DC distribution systems have a safety ground, but it does make “recommendations” as to how “grounded” and “ungrounded” systems must be interconnected with the vessel’s bonding system. Earlier, I pointed out that a battery held in hand or sitting in a dock cart has two terminals, but neither is necessarily referenced to ground. All that can be said is there is a fixed voltage between the two battery terminals. Whichever battery terminal is connected to the vehicle frame determines the polarity reference for that DC system. If the negative battery terminal is connected to the vehicle chassis, the system is considered to be a “negative ground” system. If the positive terminal is connected to the vehicle frame, the system is considered to be a “positive ground” system. With the emergence of solid state electronics and economic pressure to reduce manufacturing cost by sharing components across brands, models and manufacturers, the modern automobile industry world-wide (at least since the 1980s) has standardized around negative ground systems. The ABYC-approved, and by far the most common, DC systems found on pleasure craft in North America are “negative-ground” systems. 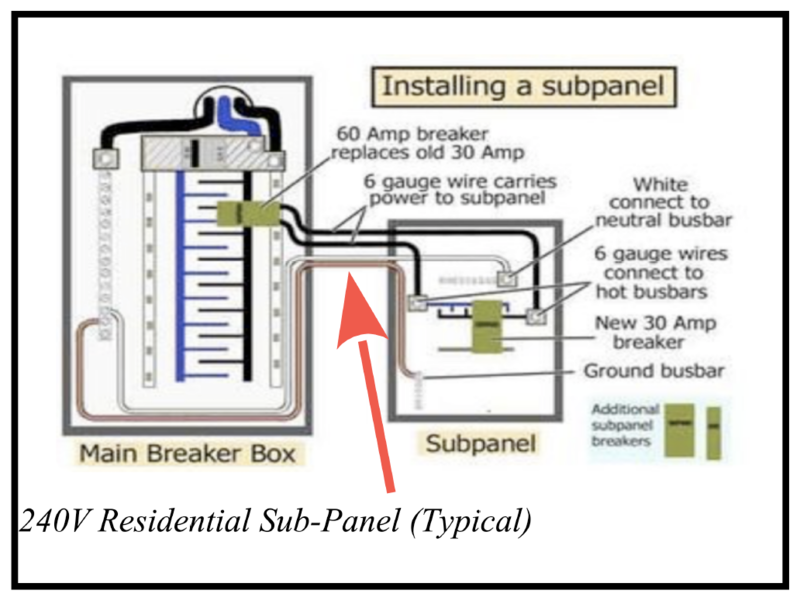 On a boat with other than negative-ground DC distribution system, the panels throughout the boat should be clearly marked to identify the manner of connection. If there is any doubt, always use a voltmeter to confirm the configuration before disconnecting or otherwise making modifications to the system. This entry was posted in Boat DC Topics, DC Electricity On Boats on 2018/09/03 by gilwellbear.